The "white" radical 白 is on duty in just five Joyo kanji, and it means "white" in exactly none of them! Well, to be accurate, it somewhat whitens the etymology of the 白 kanji, but "white" isn't the primary thing that shape represents. The kanji are 白川郷 (しらかわごう), the name of a famous historic village on the border between Gifu and Toyama Prefectures on Honshu. Wherever it is in a character, this radical maintains the name しろ. A touch of white at Hasedera, a temple in Nara Prefecture. This shape served not only as a pictograph but also acted phonetically to express "white" while suggesting "paleness relative to the skin," says Henshall. Ah, yes, a nail is lighter than the surrounding skin. However, he says, some evidence shows that the old pictograph was of an "acorn" with a whitish interior. If that's true, he concludes, "two pictographs may have coexisted." In his analysis of 楽 (218: pleasure; music) he also notes that 白 later came to mean "hundred," "white," and maybe "principal" (as in "main, primary"). One reads this 白 with its Joyo on-yomi of ハク. This cafe must be a good place to prep for math tests! 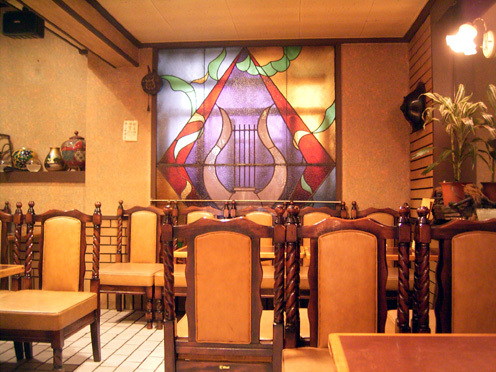 Actually, one blog post explains that both the exterior and interior of this cafe look like a chapel, which may be the origin of the 十字 (cross). But no, that's not the case! This character combines 一 (one) with 白, which means "thumbnail" here, says Henshall. He notes that in ancient times, the thumb represented "hundred." Ah, there's the connection. At any rate, the 白 doesn't mean "white" in 百, and it doesn't even directly signify "hundred." That happens indirectly. The photographer says that Paimen is the name of a really good Kyushu-style ramen shop. As for the smaller kanji, one reads them vertically. The 極楽 (ごくらく) means "paradise" and includes 白 as a component! And 汁麺 (しるめん) means "noodles in soup," which can refer to ramen, udon, or soba. Thus far, we've seen two etymologies in which the 白 radical doesn't actually mean "white." What about the other three kanji in which it's the on-duty radical? No, I'm afraid we're out of luck there, too! Let's evaluate each one. Henshall says that this 白 means "conspicuous," whereas this 勺 (usually "ladle" or "scoop") represents "select" and by extension "set apart." Something conspicuous and set apart is "a target," he says. Setting something apart gave rise to the idea of "classification," which in turn inspired the concept of "likeness." And the -like concept became a common way of forming adjectives, he says. By the way, Henshall notes that some old forms of 的 include 日 (sun, bright) instead of 白, so our radical may not have been in this character originally. This character initially referred to a "king's crown" or "ceremonial headpiece," says Henshall, later coming to refer to the person wearing such an item—namely, a "ruler" or "emperor." Appropriately enough, the old form showed a "king" (王) and his crown, so our radical has nothing to do with whiteness here. It seems that the Kirin Lemon drink has nothing to do with the pink sign, which probably says 皇室御用達 (こうしつごようたし: purveyor to the royal household) down the right side. The word 皇室 (こうしつ) means "royal household" (note that the top stroke of 皇 is angled the wrong way), and 御用達 (ごようたし) means "purveyor (esp. to the government, royal household, etc.)." The product is likely miso or saké sold in a barrel, and the idea of the ad is that the product must be great because the royal family regularly uses it. The 白 wasn't in the earliest version of 皆. In fact, Henshall calls the 白 in the current shape a miscopying. Originally, he says, the lower part was an old form of 曰 and meant "to speak, say." Meanwhile, the 比 lent the idea of "people lined up." Thus, the whole character represented "people in a row talking." This gradually broadened to mean "all the people," evolving further to include "all" in general (not just in relation to people). Kanjigen has a very different take, asserting that the 白 in 皆 used to be 自, which is how people initially wrote "nose" (now 鼻). However, the 自 in this context means "to do so." Thus, this aged symbol supports Henshall's argument. But whether 皆 used to include 曰 per Henshall or 自 per Kanjigen, we know it didn't include 白. If anyone tells you otherwise, it's as good as whitewashing!